I’ve been dressing with 33 items or less every 3 months for the last 8 years. Minimalist fashion challenge Project 333 started as a 3-month challenge to dress with 33 items or less. It made such a positive difference in my life that I never stopped. Below are 33 little lessons I’ve learned from Minimalist fashion challenge Project 333. 1. I need way less than I think to be happy. 2. Shopping doesn’t cure boredom, curiosity does that. 3. Just because something fits me well doesn’t mean I need it in every color. 4. Washing clothes in cold water and line drying them helps them last longer. 5. I never need more space, only less stuff. 6. People care more about what they wear than what I wear. 7. Comparison makes me feel like I’m not good enough. 9. Advertising makes me feel like I don’t have enough. 11. If I wait 30 days before buying something, I’ll likely forget about it. 12. I’d rather spend my free time hiking or writing instead of shopping. 13. I enjoy knowing that I can carry my entire 33-item capsule wardrobe in a carry-on bag when traveling. 14. When I’m not focused on what’s missing from my wardrobe, I can appreciate what I have. 15. There are so many things I’d rather think and talk about than what’s on sale, or where you got that dress/purse/shirt. 16. Clothes are easier to quit than carbs. 17. Investing in one $100 dress that actually fits you saves more time and money than spending on five $25 dresses through-out the year. 18. My 33 item wardrobe doesn’t work for everyone, but people from around the world (women, men, students, professionals, entrepreneurs, stay-home parents, world travelers …) with different jobs, lifestyles, and taste in clothing have made Project 333 work for them. 19. The best things are never things. 20. Most of my items work all year-long. Even though I live in a 4-season state, more than 50% of my wardrobe works for every season. 21. When you announce that you are trying minimalist fashion challenge Project 333, well-meaning friends and family will stop buying you clothing (that you never wore anyway). 22. Mornings are easier with fewer options. 23. Dressing with less saves you money. 25. Completing a challenge builds confidence. 26. Fewer decisions about what to wear allow more clarity for more important choices. 27. This is not a challenge in suffering. If something needs replacing, I replace it. 28. It takes time to figure out what really fits your body and your lifestyle. 29. I am not my past purchases. Now that I’ve let it all go, I let the guilt and shame of overspending and holding on for so long go too. I’ve paid enough. You have too. 30. Most of my clothes have lasted way longer than I thought they would. 31. When I think I’m frustrated or bored with my wardrobe, I think about what’s really going on. My emotions rarely have anything to do with my clothes anymore. 32. Project 333 inspires interesting conversations and beautiful friendships (see hashtag #project333 on Instagram). 33. Simple is the new black. Check out my recent Project 333 Q & A recording: click here for video or here for audio-only. Try the dress with less course for extra fun, accountability (comes with a private FB group) and step by step instructions. Join me on Instagram for future updates and simple inspiration. If you already practice Project 333 or have tried the challenge before, tell me about it! Comment here with a little lesson you’ve learned along the way. – De-cluttering your clothes actually means de-cluttering – it doesn’t mean removing clothes as an excuse to shop! – I don’t need a separate capsule for my casual and work clothes – I used your tip of dressing up my casual wear and dressing down my work wear slightly – and no-one noticed! – Fewer clothes may limit the pieces I own but not my choices or creativity. Thank you for your continued inspiration, Courtney. My most minimal (?!) wardrobe was a few summers ago. I had three staff shirts (they ran out of my size), 3 pairs of capris, and two tank tops for the weekend. Plus exercise/sleepwear. It was summer and I did a load of laundry twice a week. I normally have a small wardrobe, but 8 pieces was an interesting (unplanned) challenge! YES! Clothes are (so much) easier to quit than carbs. LOL! I’m into my 3rd season of project 333 and becoming bored with my wardrobe. Temps have reached well over 100 degrees the last few weeks, making it difficult to wear some of the outfits I was wearing at the beginning of the season. 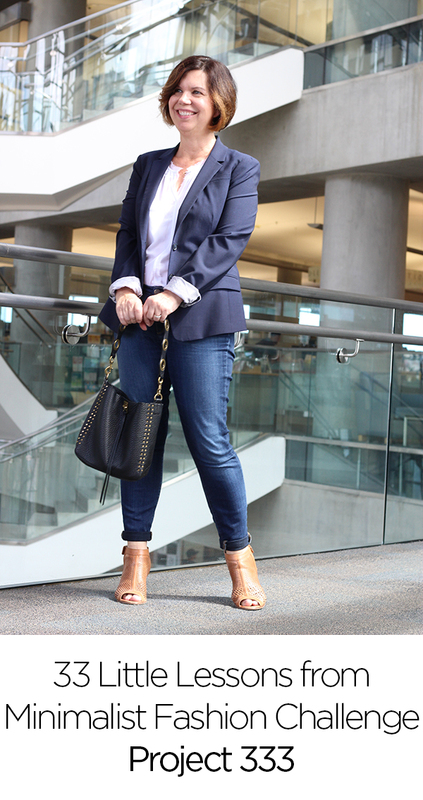 I welcome any feedback or suggestions for getting through the hot summer months with a wardrobe that is both work appropriate (I’m a psychologist working in a medical clinic) but I can wear in more casual evening and weekend outings in the stifling south Texas heat. Thanks y’all! I totally feel you! The first time I did Project 333 Inwas working outside the home. I currently work from home and find Project 333 to be so much easier!! I think it’s totally ok to swap out pieces as the weather changes. Do you like to wear dresses? It seems like those would transition well from an office (add in a light jacket or accessories) to hanging out in the evenings (maybe change up the shoes and jewelry?). Silk, linen and lightweight wool all have reputations for being good hot weather materials. The key is loose fitting but with long sleeves and bottoms so the sun does not reach exposed skin. I often wore oxford cloth shirts with the cuffs unbuttoned but not rolled up. Former Houstonian here: I lived in solid color A line or empire waist dresses. I’d keep a blazer or sweater on my desk chair along with a light summer scarf because the AC is no joke! A dress was breezy, didn’t touch as much of my sweaty body, and still looked professional. I had maybe 2-3 of them, let them sit between wearings and then handwashed or washed on delicate and hung to dry. I absolutely was bored, but I eventually realized that it was more a low-level irritation from the oppressive climate (I called it August Anger) than anything else! I know what you mean! The temp is 111 here in the Phoenix area today! Ugh! I have to tell myself not to be rigid. A few tops with 3/4 length sleeves have not been used once! I chose to put them away and buy two new short sleeve shirts and I’m okay with that because we wear short sleeves year round here. Also, if I need to have an extra pair of shoes, I put them in. And, although I choose a handful of accessories to go with my wardrobe and put the rest away, I never count them towards the 33 items. So, technically, I’m around 43, but who cares? I still love looking in my closet and seeing it so pared down and full of things I like. It’s so restful to choose from less items! Tweaking my items even in the middle of a 3 month period is allowing me to really discover what I enjoy wearing. I’m hoping I will eventually develop a capsule wardrobe that reflects my style year round. Hope my cheating helps you figure out what to do for you! I love the idea of a capsule wardrobe and have been honing mine for about three years, thanks to Project 333. 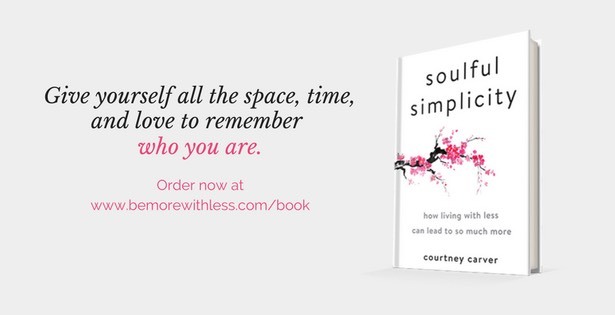 I bought your course, Project 333, and your book, Soulful Simplicity. I have not purchased new clothing since December 2016 (directing the money saved to singing lessons!). If I need something, I shop at My Sister’s Closet. We have three seasons here along the Southern California coastline: cold, perfect, and hot, with the “extremes” lasting for only short periods. My goal is to get to a year round line-up where 50% of items are repeated. Everything in my closet fits me (local tailor), is comfortable, and looks cute and pulled together. Rather than making you bland, this type of restraint makes you even more creative and thoughtful about your clothing. I love the process! Your posts encourage me to quietly pursue my path and enjoy the calm created by a simple closet. I always look nice and would never wear yoga pants to Trader Joe’s (your voice in my head)! 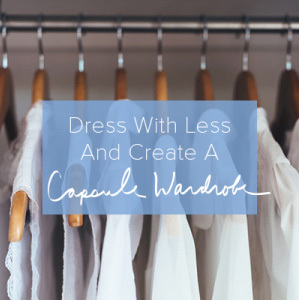 I minimized my wardrobe a few year ago and I agree a seasonless wardrobe is easy to maintain and easily fits in my small closet and small dresser. (No switching out a wardrobe from storage twice a year! Hated doing that as a kid, went seasonless when my parents let me pick my own clothes.) I love layering because it allows me to quickly adjust for heat or cold. I also opted to buy all my bottom pieces and sweaters/jackets in black or grey so they go with every top I have. All my shoes and bags are black or silver for the same reason. I do have more than a few earrings but I wear them all often. Everything is a classic style so it lasts for years. I also keep the style simple so they can be dressed up or down with jewelry, shoes, or a topper. I needed this today as I was super tempted (been thinking about it for a few days) to buy additional pairs of a great jean that I love but I’m currently pregnant and couldn’t even wear them. Thank you for the reminder that you don’t need to buy an item in every single color just because it fits you well. THANK YOU! I used to have a very tight minimalist wardrobe (at one point I had 16 items! ), and I still own fewer outfits than most. However, the one area where I splurge is work-out clothes. I practice yoga in a studio almost daily (sometimes twice a day), and I absolutely have to wear fresh, clean clothing to class! In a warm climate, yoga and stinky sweat simply don’t mix. 😉 So my wardrobe consists of sundresses with toppers (to wear professionally), a pair of jeans, a pair of dress pants, and a pleothora of stretchy, yoga comfort! Good thing the rules of minimalism aren’t set in stone! 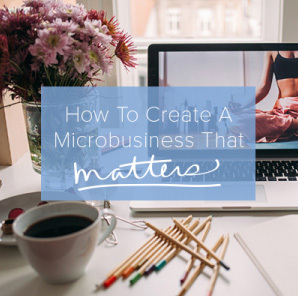 I’ve just started following your blog and this post just totally spoke to me! I still need reminding that my outfit does not define me and that clothing is not something to spend hours focusing on! Thanks for your important reminders. I was tabling at an event the other day (which is at least 50% people watching). I was noticing the trends going by and thinking to myself that I’ve now been doing Project 333 long enough that I’m definitely not “on trend” anymore. Within the next 20 minutes three different people complimented my dress. It was a great reminder that wearing something you love and feel good in is more important then wearing something trendy. A really interesting post. I’ve experienced a lot of the lessons. Less is really more. Hi. I’ve been trying to practice Project 333 for 3 seasons now but for some reason 33 items is just not enough for me. It has made me think a lot about it and why is that so and I think it is because I like change too much. I feel a little disappointed after every try to declutter my wardrobe and arrive to the 33 items goal (which I never get to)- my number never gets lower than 50 pieces. I have never gone all the way down to 33, but Courtney’s challenge has nonetheless been life changing. For several years now I have boxed out-of-season clothes and pruned my wardrobe at every season change. I love looking in a half empty closet or drawer. Also, if I put on any piece of clothing and take it off again without wearing it, it goes in the outbox. I feel ever happier as the number of choices shrinks while my confidence that the remaining pieces will look good on me and go well together grows. I made a variation that could be tough for holding the line at 33 but that makes me happy. I started giving one key color per season a rest. So, black is a mainstay for me 3 seasons out of the year but I retire it for the summer. (Added bonus, no need for black sandals.) Then in the fall when I add it back in, it feels extra special. No blue in the fall, no olive in the winter, and no burgundy in the spring. I have colorful scarves that tie the pieces together. I spend less time on selecting an ensemble because I know one of my scarves will make everything look intentional. Each scarf gets a rest for at least one season. I have about 3 active scarves per season. I love jewel tones. When I became conscious that was how my plan had evolved, I also realized that I could completely skip beige and brown. This has further streamlined things, especially in the shoe department. My office at work can be freezing cold year round, but not predictably. I have always relied on layers, but I had more choices than I could really manage. Early this year, my workplace issued warmup jackets with our new logo. I keep my work jacket at work for the times when it’s cold and it has allowed me to further edit my cardigan collection. Thank you, Courtney, and all of the commenters who shared their stories and tips. I don’t practise Project 333 but the last time I counted my clothes and accessories, last autumn, it came to spot-on 33! Having cut down my wardrobe I found that nobody seemed to notice I was wearing the same things all the time, but they did tell me I was looking stylish.